Of the 5,930 Delta pilots either active or furloughed, 5,295 pilots (who average $151,000 per year) voted yes on the strike authorization ballot being pushed by their union, the Air Line Pilots Association, Int’l (ALPA). Atlanta-based Delta sought approval to reject its contract with its pilots so it can impose up to $325 million in long-term pay and benefit cuts, which would include a wage reduction of at least 18 percent. Delta's pilots previously agreed to $1 billion in annual concessions, including a 32.5 percent wage cut, in a five-year deal in 2004. An arbitration panel must decide by April 15 whether to void the pilots' contract. The union has said it will strike if its contract is rejected. The nation's third largest carrier, which is operating under bankruptcy protection, has said a strike would put it out of business. This is a tough one to swallow. I cannot comprehend making $151Gs a year to get the chance to fly big jets… it would be a dream job at half that salary to a pilot like me. But I’ve never had the responsibility of keeping 200 pax alive either when things get dicey, and that’s when you want a happy, high-paid driver in the left seat. 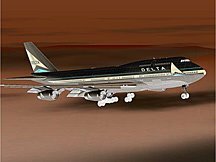 If Delta does not survive this round of union bickering – if this is the real thing and the pilots do walk – Delta says it will go down in flames financially. That would change the commercial aviation landscape big time, pushing almost 6,000 trained, professional pilots onto the job market. And if that happens, look for the new upstart air taxi guys waiting for their fleet of Eclipse’s to be built to become knee deep in resumes. And with only two legacy carriers left, watch for JetBlue and Southwest to fight it out for those empty Delta gates at hubs across America.